Mondoro, Mali, 15 April 2015 -Community representatives and wildlife officials met from 3-6 April and agreed urgently needed conservation measures for elephants contributing to the implementation of the CMS West African Elephant MOU, including the formal establishment of a new transboundary law enforcement mechanism at the village level. The meeting was entitled “Inter-community transboundary workshop on the themes: local elephant protection and community mobilization to strengthen implementation of the transboundary agreement” and was attended by 80 participants representing communities, local government and the private sector. Priority actions agreed also included the reduction of human-elephant conflict, the strengthened mobilization of all sectors of society and a follow-up community workshop in Burkina Faso. The meeting built on a project which trained 157 young people from eleven villages during the past year to form a vigilance network either side of the Malian and Burkinabé border in response to the rise in incidents of elephant poaching. 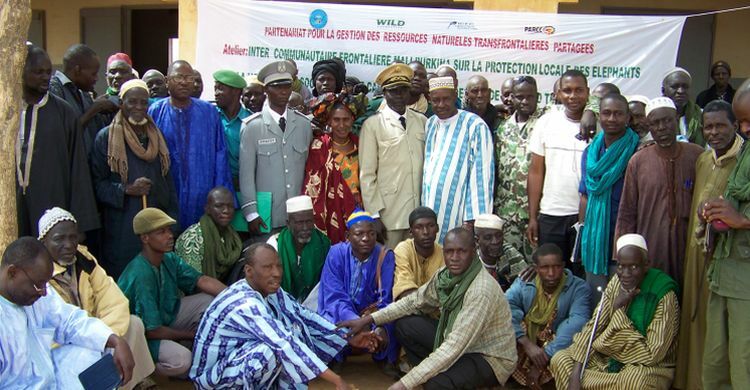 This trans-border network of vigilance brigades is now part of a larger Malian network of around 800 young men covering 72 settlements throughout the 32,000 km2 of the elephants’ range. The brigades work hand-in-hand with the authorities and are now connected across the international border through a transboundary committee. Project activities also included the construction of fire-breaks which will also protect habitat for livestock and elephants and thereby reduce competition. A generous voluntary contribution from the Government of Monaco provided funds for this emergency response project, which is coordinated by the WILD Foundation in Mali. Unfortunately 2014 saw a dramatic rise in elephant poaching, and almost 40 individuals have been killed since 2012. The elephants migrating through the Gourma region of Mali and Burkina Faso are unique desert elephants adapted to the harsh Sahel climate undertaking a 600 km annual migration, driven by the availability of vegetation and water. The elephant population numbers around 350-700 animals - an aerial census due later this month organized by Elephants Without Borders will provide the data to estimate the current population size.